This is the 6th temple in the Nava thirupathi temples and comes under Pandiya naatu divyadesams of Sri Vaishnavas. 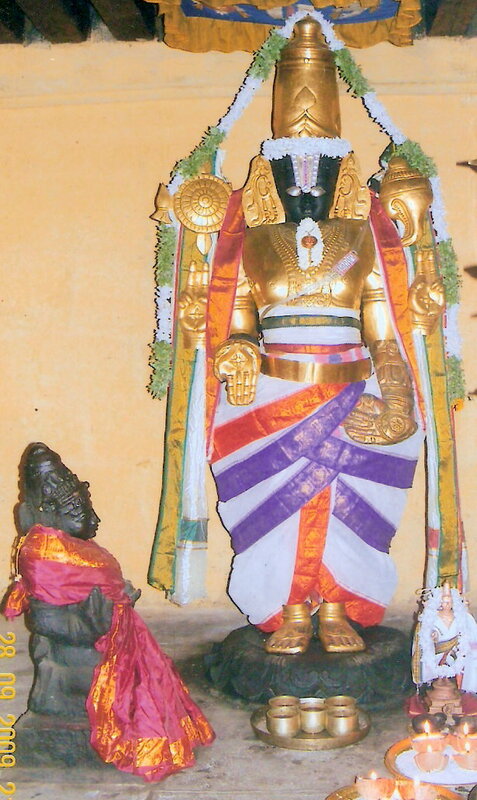 The presiding deity is Srinivasa perumal or Soranadha perumal in standing posture, utsavar is known as Mayakootan and thayars are known as Alamelu mangai and Kulanthaivalli. The upper two hands of the Lord have prayoga chakra and shanku while the other two are in the posture of varadha hastam and kadi hastham. The temple represents the Shani sthalam among the Nava graha kshetrams. A unique feature of the temple is the presence of Garuda along with the utsavar inside the sannadhi. The Lord’s idol in the sanctum sanctorum is in standing posture, facing east. 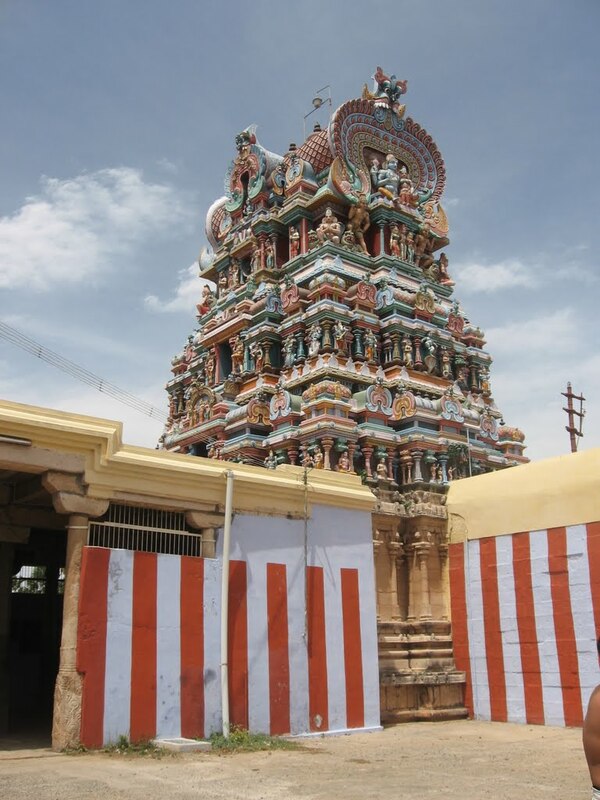 The presiding deity here is named Venkatavanan ( also known as Srinivasan). His consorts are Alarmelu Mangai and Kulandaivalli thayar. They do not have separate sanctums. The Utsava Moorthy is called Maya koothan. Placed on the same pedestal, close to the Utsava Moorthy, is the shining idol of Garuda. This is something unique. All the idols were beautifully decorated. On the southern side of the temple, there is a separate shrine for the god known as “Kazhuneer Thottiyan”. He has been assigned this name as the waste water emanating from the temple’s Thiru madapalli ( the place where the temple prasadam is prepared) flows out through His feet. Vedasaran and Kumadavalli, a pious Brahmin couple, lived here. They had a daughter by name Kamalavathi. Determined to marry only the Lord, she did rigorous penance here. The Lord granted her the boon and gave her a permanent place on his chest. Pleased by that, Vedasaran involved himself in performing daily pooja here. His wife Kumudavalli rendered all help to him. One day, when she was on her way to the river Tamiraparni, a demon by name Asmasaran took her away by force and kept her in the Himalayas. Upset by this, Vedasaran offered special prayers to Lord Venkatavanan and sought His help for getting back Kumudavalli. The Lord caught hold of the demon, who waged a fierce fight before losing. Subduing the demon, the Lord threw him down, danced on his body and killed him. This resulted in His getting the name Maya koothan. Kumudavalli was restored to Vedasaran. Pleased by the excellent service rendered by Garuda, who took Him on his back to and from the distant Himalayas, the Lord gave Garuda the seat very next to Him on the same pedestal. 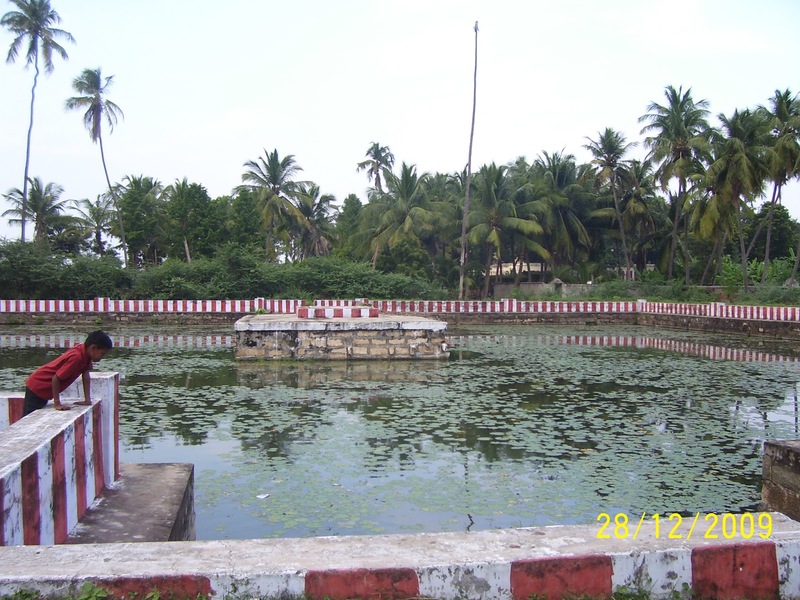 In this sthalam, a very big lake (kulam) is found and because of this, the sthalam is also called as “Perungkulam”. The temple is open in the mornings from 7.30 am to 12.30 pm and in the evenings from 4.30 pm to 7.30 pm.